Wow – not a room I could face first thing in the morning. And between my cats and my habit of spilling tea on everything, I’ll never have white furniture. But I think the colors work well together – I used to find orange too bright but now I like it more. I actually don’t mind it. Being that I live in a climate that for most of the winter and spring it is cloudy and grey, this would be a nice reprieve. Way too bright. I like nothing to distract me except my book. I’d be too stimulated (but not in a good way) in this room to read. I do not like the colors. Oh, how cheery. But do I detect books shelved by colour? I suspect I’d be blinded by the colour, stumble and open a major artery on the glass table and not live to enjoy the room. 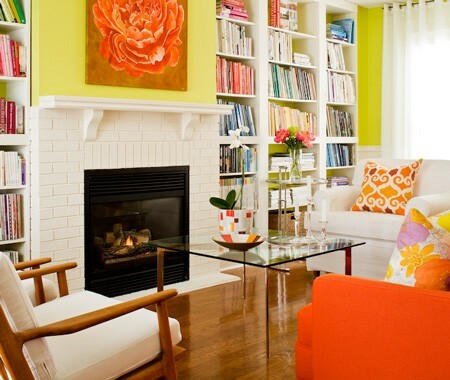 I do like a painted brick fireplace tho’. on September 16, 2012 at 06:53 | Reply Karen K.
I think my eyes are melting!! Not restful AT ALL. That would be useful when it started to get darker, if only to make it seem brighter than it is, but maybe a bit too much. Looks better as a photo. I have a headache just looking at those colours. OK for a birthday card but nothing larger, certainly not a room I’d wish to be for longer than five minutes, and then with dark glasses! But what fun to to look at rooms we don’t like as well as those we do!